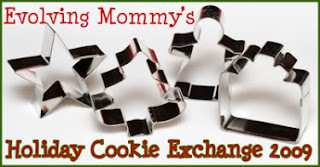 Visit Catherine at Evolving Mommy to see more yummy cookie recipes. B found this recipe in a school library children's cookbook. These are some of the most delicious, unique cookies I have ever made. They are simple enough for the kids to help and mommy to not pull her hair out while letting the kids help. 1. In a large mixing bowl, combine peanut butter, chocolate chips, and 1 cup graham cracker crumbs with a rubber scraper. 2. Add the sweetened condensed milk and mix with the rubber scraper. 3. Form 2-inch balls of dough. Press 3 or 4 mini marshmallows into each ball. Pinch dough so that it completely covers the marshmallows. 4. Place the remaining graham cracker crumbs into a small bowl. Roll each ball in the graham cracker crumbs. 5. Spray baking sheet with nonstick cooking spray. Place dough onto cookie sheet, about 2 inches apart. YUM! Those sound great. Logan loves to cook. We might just have to try those out! Can I express my love to you for using a recipe with peanut butter? you really can't go wrong with chocolate and peanut butter... but you can go more right by adding marshmallows! Yum! Sounds Yum-o - We are having a cookie party next week, think I will give it a try! !